Forget about calling the jail or waiting in a lobby. Everything you need is right here. 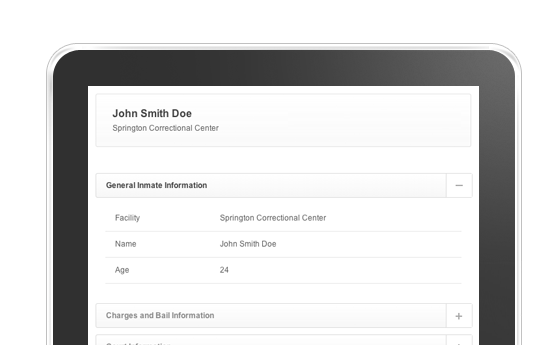 Inmate Info Search (IIS) is surprisingly intelligent and lightning fast! Instantly see your loved one’s case information, such as charges and bonds, without calling or driving anywhere. Work for a facility and want to make things easier for your citizens and staff members? Know a facility that needs to be added? We want to hear from you! © Copyright 2013 InmateInfo.com. All Rights Reserved.